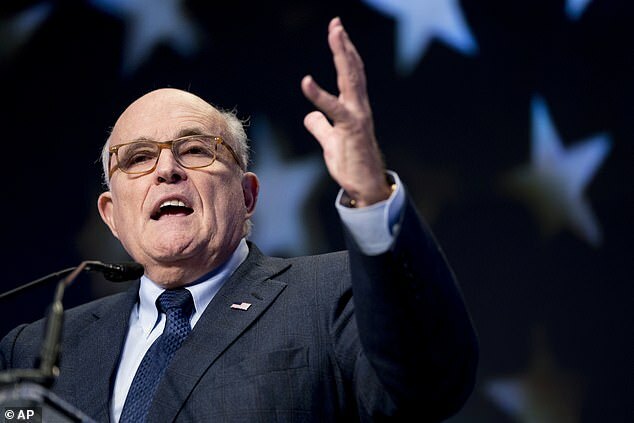 President Donald Trump’s attorney Rudy Giuliani has said that the rebuttal he is preparing to special counsel Robert Mueller will seek to discredit the President’s many familiar foes who were involved in various stages of the investigation. ‘You’re d**ned right we are. I can’t imagine how we wouldn’t’ target the various personalities involved, Giuliani told the Huffington Post on Friday, after Trump announced the ‘major counter report’. FBI lovers Peter Strzok and Lisa Page, high DOJ official Bruce Ohr and his Democrat consultant wife Nellie, and British ex-spy Christopher Steel, who authored the ‘dirty dossier’ for Hillary Clinton’s campaign, are all said to be prime subjects of Giuliani’s report. ‘I could write a whole book,’ Giuliani said of the various players involved, saying he planned to lay out an argument that the investigation was tainted by partisanship and illegitimate surveillance of the Trump campaign from the very beginning. ‘We will be doing a major Counter Report to the Mueller Report. This should never again be allowed to happen to a future President of the United States!’ Trump added. 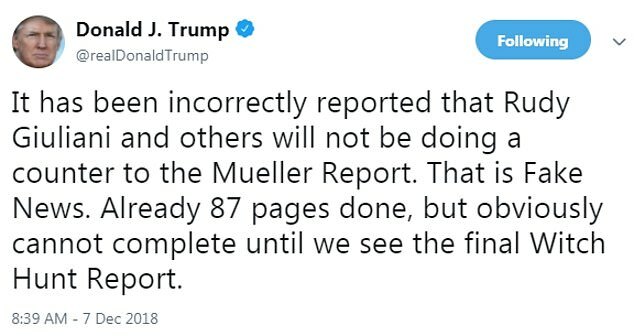 Giuliani confirmed the draft report is approximately 87 pages at present, but noted it could run longer or shorter when released, depending on what Mueller publishes and what responses Trump’s team includes. 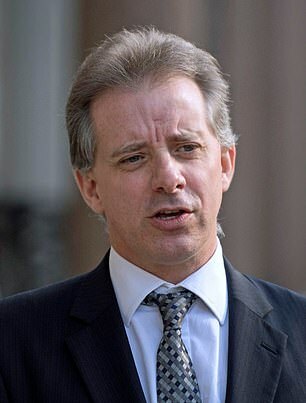 The report will likely make the case that Mueller’s probe has its origins in the dossier that Steele was hired to write by lawyers for Clinton’s campaign and the Democratic National Committee, alleging links between Trump and Russia. 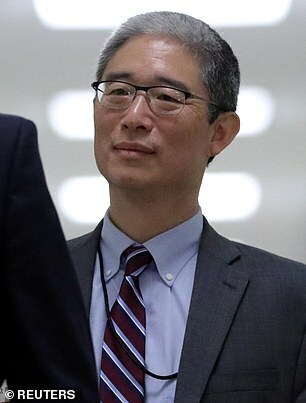 Steele’s contact at the Department of Justice was Bruce Ohr, whose wife Nellie Ohr was hired to conduct opposition research on Trump for Democrat-financed consultancy Fusion GPS, which also contracted the Steele dossier. Giuliani will likely argue that that the Democrat-financed Steele dossier was funneled into the DOJ by Ohr and formed the main evidence that partisan FBI investigators used to obtain surveillance warrants on Trump campaign advisor Carter Page – a claim investigators have denied. Strzok and Page will also come under scrutiny in Giuliani’s report. 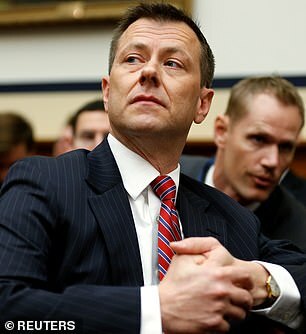 Strzok led the FBI’s investigation into Russian election interference before becoming the top agent on Mueller’s team after the special counsel was appointed. Text messages between Strzok and lover Page, an FBI lawyer, revealed strong anti-Trump sentiments and a cryptic reference to an ‘insurance policy’ against a Trump presidency. 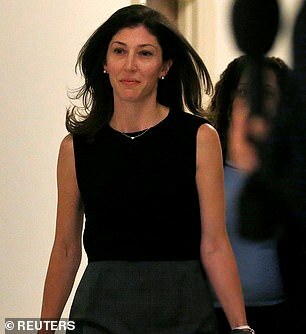 Strzok was fired and Page resigned from the FBI, and in testimony they both strongly denied that any political bias affected their work. Giuliani’s report is also likely to take aim at fired FBI Director James Comey, his deputy Andrew McCabe, former CIA Director John Brennan, and former Director of National Intelligence James Clapper, painting them as partisans who planted the seeds of the Russia investigation to damage Trump’s candidacy and presidency, which they deny. In addition to the attack on the probe’s legitimacy, Giuliani said he also plans to make legal arguments, including that Trump is immune from obstruction charges while acting in his legal capacity as president. Trump’s firing of Comey in May 2017, which led to the appointment of Mueller, could not be obstruction of justice, Giuliani argued. ‘As a matter of law, there can’t be obstruction in this case,’ he told HuffPo. Responding to the charge that prior to firing him Trump had asked Comey to go easy in investigating his national security advisor Mike Flynn, Giuliani said that Trump had merely made a polite request because he believed Flynn’s innocence.